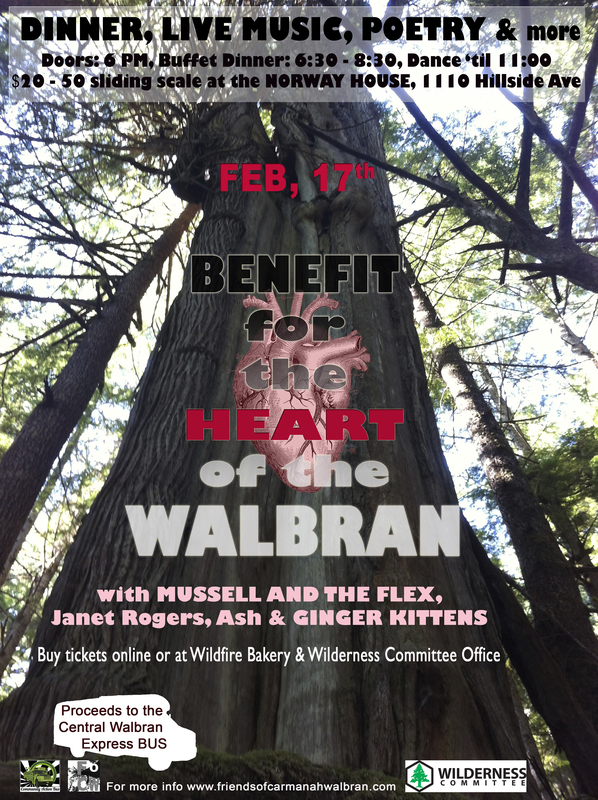 Benefit for the Heart of the Walbran. Update; As of February 15th, the dinner is almost sold out, there will only be 10 tickets for the dinner for sale at the door. Tickets still left for the exciting music event which starts at 8pm. Going to be a fun night, see you there. On February 17th, you are invited to a night of love and celebration for all that is wild in our world and our hearts, for good music, great food and amazing spoken word poetry. Join us at the Norway House for live music by Mussell and the Flex, poetry by former Victoria Poet Laureate Janet Rogers and ASH. This is an evening not to be missed! Over the last year-and-a-half, the campaign to save the Walbran Valley (unceded Pacheedaht/Qwa-ba-diwa territory) has regained momentum and supercharged the fight to protect the remaining old-growth rainforests on Vancouver Island. Community interest in the protection of the unlogged and threatened 486-hectare heart of the watershed – a place of stunning waterfalls, emerald pools, volunteer-built boardwalk trails and rare biodiversity – has skyrocketed. The best way to galvanize individual support for the Walbran Valley is to get people there, but not everyone has the privilege of being able to access this relatively remote rainforest wilderness on their own. The Friends of Carmanah Walbran, a grassroots, volunteer run group, and Community Action Bus are fundraising to purchase a 20 seat mini-bus that will offer affordable and subsidized transportation to a place that is renowned for being an elixir of spiritual renewal, inspiration and mental health to the folks that visit. We are now in our last push to raise the funds needed to make this dream come true! All proceeds go towards the Central Walbran Express Bus! *We acknowledge that this event will be taking place on the territories of the Esquimalt and Songhees Nations.